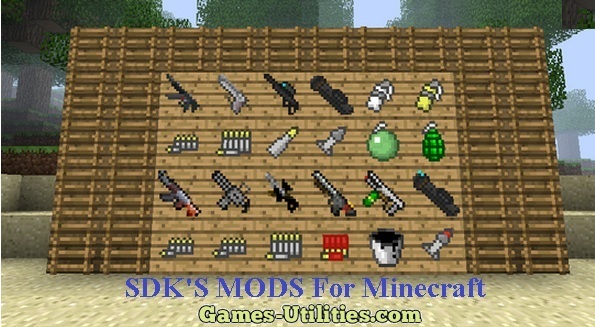 SDK’S MODS for Minecraft. All new SDK Mod for latest Minecraft version is now available. SDK Mods basically features Guns, ammunition, Grenades and alot of variety of weapons in it. SDK’S Mod for Minecraft will be having update with every release of Minecraft version so you will never get bored of it.. So check it out yourself..
AK47, MP5, sniper rifle, new gun, shotgun, flamethrower, desert eagle, rocket launcher, laser-guided rocket launcher, SG552, Gatling gun. So guys have fun playing Minecraft with SDK’S Mods and don’t miss to comeback here and check the latest updates of your favorite game online. If you are having any problems related to this tool just feel free report via comment section..